Lenzr.com is Canada’s premier serial photo contest website, and a great way to engage yourself and your family in artistic and technological activity. Lenzr has just launched a brand-new website and four new photo contests to challenge you and your kids. Lenzr is a positive and supportive community that rewards great photography with real prizes like computers and cameras. During voting time, participants in photo contests are encouraged to share their work online with their friends and family to get votes and increase their chances of winning. The Construction Sights photo contest is looking for submissions catching a moment in time through the building of a new structure, roadway or monument. This time of year, especially in the city, construction sites are in abundance. Let your kids pick the site they find the most interesting, and help them with angles and composition–this will give you surprising insight into the unique take on the world your children have. Show us a crane towering above the ground or a bulldozer spreading a cloud of dust as it delves deeper into the ground. Perhaps your kids will want to show the human aspect of contruction–the people who toil in the heat or the rain to make improvements to the world we see every day. 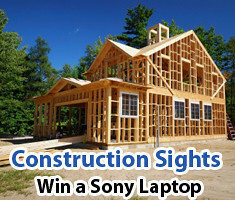 The prize is a Sony laptop, courtesy of the contest’s sponsor, an award-winning Ottawa roofing company. This is Lenzr.com’s ‘adult only’ contest; the Best Office Staff Party photo contest is looking for submissions illustrating how your office space looks when it’s used for purposes outside of work–partying, to be specific. Have fun with this one! Show us what the gang at work does to let loose and de-stress. Do you bring your significant others along to be subjected to inside jokes about what really happens in the boardroom? Do you use your boardroom to party, transforming it from a sterile meeting place to a dance party complete with disco ball? Lenzr.com hopes so, because that would make a great photograph. The prize is a Sony laptop, courtesy of the contest’s sponsor, an IT Staff agency located in downtown Toronto. This is the contest where you’ll probably need the creative and open mind of a child in order to come up with the best concept. Lenzr.com’s A Counting Exercise photo contest is looking for submissions featuring repeating patterns that may be counted in a photograph. Kids, still new to the world, often immerse themselves in patterns, noticing things adults have forgotten to look for. Show us how many ants are on parade back to the anthill, strips in the hardwood floor or cookies in the cookie jar. You could tell them to pretend they’re the Count from Sesame St., who doesn’t love a vampire with arithmomania? 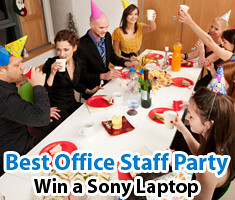 The prize is a Sony laptop, courtesy of the contest’s sponsor, a team of web-savvy Toronto accountants. 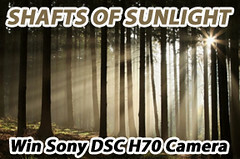 The final photo contest this session, Shafts of Sunlight, want to see submissions featuring natural light appearing as tangible matter you can hold in your hand. Look at the example above–the shafts of sunlight you see could almost be monkey bars ascending up to the heavens. This is the most specific photo contest this session, but sunlight is readily available this time of year; there’s no reason why you and your kids couldn’t come up with the winning entry, especially because the prize is a perfect one to give a budding young photographer. The prize is a Sony Cyber-Shot digital camera, courtesy of the contest’s sponsor, a sunrooms installer. All the contests started on June 1, 2011. Voting starts on July 15, after which the top ten user-ranked photos advance to judging. Lenzr.com doesn’t mind, in fact, Lenzr.com encourages you to have your friends and family vote on your photos for higher chances of winning. The winning photographs will be announced on August 1, 2011. Good luck!